Please note that they do not stay in my muffin tins long before someone is eating them. Honestly I am not sure what to call these. I saw the recipe on Pinterest originally and figured I would give it a try. 12 slices of bread cut on the diagonal (lesson learned from the original recipe, not circles, diamonds. Lightly grease the cups of a muffin pan with butter. Cook bacon lightly for approximately 7 minutes it will finish cooking in the oven. Quick note if you are using turkey bacon do not pre-cook. 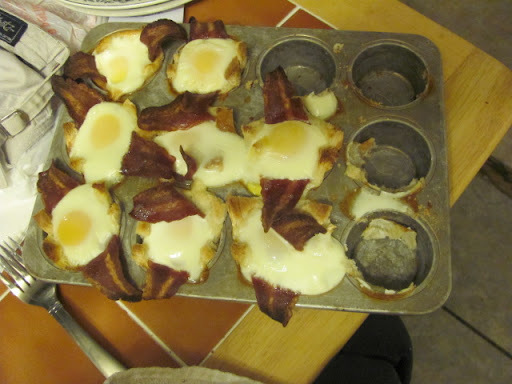 Place 1 slice of bacon in each cup and press into the bread. Place in oven and bake for approximately 20 minutes. Whites should set. Less time for squishy yolks more time for hard yolks. Just a minute or two either way. Remove from muffin tin using a butter knife to separate toast from the edge.